While writing in books is generally discouraged, annotations and marginalia in books can offer valuable insights into the impact of books in their contemporary and later contexts. As part of the ‘Books in unexpected places’ event taking place at Special Collections this coming Saturday, a display of annotated rare books will offer a glimpse into the private relationship and interaction between reader and text where the distinction between ‘book’ and ‘manuscript’ becomes blurred and mass-produced texts become unique artefacts. The display, entitled ‘Unexpected insights’, will be available to view in the Special Collections reading room throughout the ‘Books in unexpected places’ event on Saturday 21 November, and will give visitors the opportunity to closely examine a number of examples of annotated books dating from the fifteenth to the twentieth centuries, including some of our incunabula, or early printed books. Book provenance and marks of ownership are among the most fascinating features of rare books, and looking for examples to include for this exhibition has been a very interesting experience for both me and my job share colleague, Erika Delbecque. 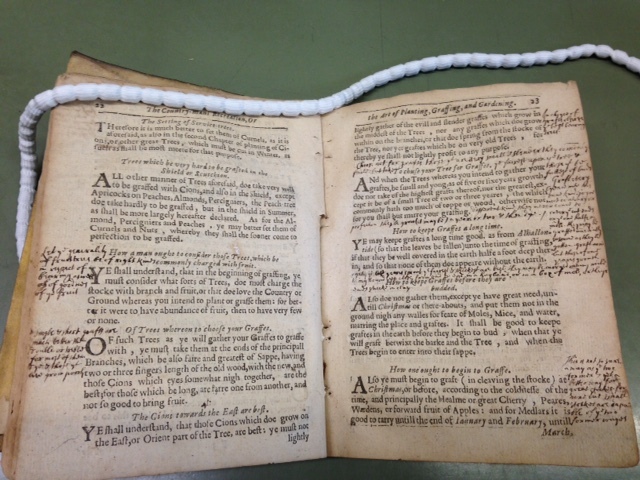 Among the gems that we have selected for this display are a seventeenth-century gardening manual with practical hints added by a former owner [see image below], and a 1640 edition of the works of Ben Jonson, which has been censored by a previous owner who crossed out all oaths and references to faith in several plays. Annotated pages from ‘The country-mans recreation’ (London, 1640) – RESERVE 634. The exhibits have been selected from a wide range of the rare book collections held in Special Collections, and are just a small selection of the many examples of annotated texts that we hold in the collections. The ‘Books in unexpected places’ event is part of the Being Human festival 2015, the UK’s only national festival of the humanities, and is a one day event exploring the idea of the book by thinking about writing in the past, how books were used and the books we find in unexpected places. Join us for a fascinating series of short talks, discussions and displays at the Museum of Rural Life/Special Collections on Saturday 21 November, 11.00am – 4.00pm. You’ll find a full programme for the event here. While admission to the event is free, places are limited so make sure to book in advance. To see more examples of marks of ownership on rare books from our collections, including fine examples of bookplates, armorial bindings and ownership inscriptions, look out for ‘Ex libris : marks of ownership in rare books’, one of our forthcoming exhibitions which will be on display in the Special Collections staircase hall from 4 April – 1 July 2016.